The 17-4 stainless steel clubhead is wide with a shallow face. I like the way this looks at address, and it will give you confidence. They've rounded the sole to help lessen the drag when hitting the turf and given the club a heel weighting, which will help you close the club face more easily. I recommend this 3 wood for mid to high handicappers. You will enjoy hitting this club off the turf and off the tee. The trajectory is strong, and the ball flight is a bit more penetrating then I would expect. The big head is surprisingly light, and the low center of gravity helps you get the club down to the ball. For lower handicappers, I recommend the Nike Victory Red STR8 Fit Fairway Wood. 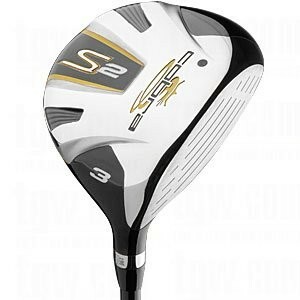 This is a really cool new 3 wood that has a traditional pear-shaped head that is adjustable to 32 different positions. You will spend a bit more money on the Nike, but you will love this fairway wood.